Please visit the Curé d’Ars Annual Fund webpage for complete details and resources about the Fund. Thank you for your interest in the Curé d’Ars Fund. 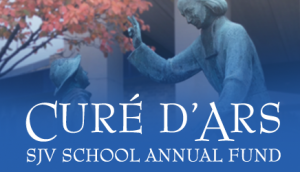 The Curé d’Ars Fund supports St. John Vianney Parish Catholic School. The Curé d’Ars Fund is necessary because school tuition and fees cover only a portion of the overall cost to educate a student and to operate the school. The Curé d’Ars Fund campaign will close on June 30th. After the conclusion of the campaign, an Annual Report will provide final numbers and detail how the money raised during the campaign was spent on each of the 3 above stated Curé d’Ars Fund goals. Thank you for your generosity and your continued support of our Catholic day school.